My friend is having a champagne and chocolate party tonight where everyone is supposed to bring the two name ingredients to share. Right up my alley! And I had an excuse to bake – something I’m not doing lately since the Chap and I are on a clean eating kick. I figured I’d make my famous Mounds Bar Cake. It is ridiculously easy to make, but looks tres fancy. Perfect for a girls’ night. Last round, I made the cake from scratch (recipe at the end)…which is definitely worthwhile if you have the time… starting this at 7:30PM on a rainy Thursday night definitely dictated a box was in the mix. If I was cheaping out, I would cheap out at $0.99 for this one. While your cheap box cake is baking, assemble the filling. Pour yourself a Valentine’s Day themed glass of wine (Mad crush for my live in crush), and combine a 14oz bag of coconut and 14oz of condensed milk. Chill it until you’re ready to use. How easy is that?? Cream the first three ingredients, then slowly add the powdered sugar until fluffy. Don’t chill – it changes the consistancy. Watch something on Netflix for 30ish minutes, then you’re ready to assemble your cake. Ask your boyfriend to leave the room, as he’s going to want some and there is none for him. Take your filling and layer between to cakes, reserving maybe 3/4 c for the top. 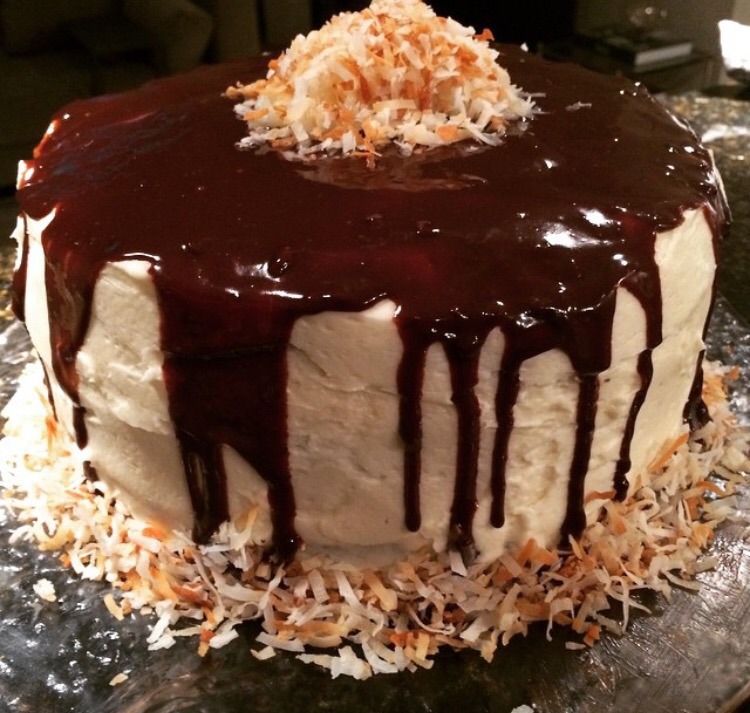 Then, you’re ready to cover the cake in the coconut buttercream you made. I want to say that I’m fancy as hell and made a crumb coating of icing. Hahahaha. We know me. I had refrigerated my icing for 60 minutes during a longer than recommended Netflix break. The consistency changed and made a huge mess. I scraped it all off and started over. Whatever. Melt 1/2 c of chocolate chips and pour over the top. Once cool you can add your remaining dollop of filling and coat with toasted coconut. Preheat oven to 350. Grease and flour two (9) inch round pans. In the bowl of your mixer, combine sugar, cocoa powder, flour, baking soda, baking powder, and salt. Add eggs, oil, and buttermilk and beat on medium speed for two minutes. Scrape sides of bowl and stir in boiling water. Divide batter into cake pans (batter will be thin) and bake for 30 minutes or until tops spring back until lightly touched. Allow cakes to cool in pans for about 5 minutes, then remove to cooling racks to cool completely. Prepare filling: In a large bowl, combine coconut and sweetened condensed milk. Refrigerate until ready to use. Prepare ganache: In a microwave safe bowl, zap chocolate chips for about 30 seconds. Prepare frosting: In the bowl of your mixer, beat butter, cream of coconut, and heavy cream on medium speed until smooth. With the mixer set on low, slowly add powdered sugar. Once the powdered sugar is just barely mixed in, increase speed to high and beat for one minute until fluffy. Assemble cake: Spread coconut filling between layers. Frost. Spread ganache on top, letting it drip down the sides. Top with extra filling and toasted coconut if desired. Next Post Dessert Verdict: Not Guilty!